Jake wears trench Burberry, turtleneck Reserved, pants Dior Homme, and shoes Topman. Jake Lee checks into London Nobu hotel for our latest exclusive. The Nevs model connects with photographer Karen Rosalie for the occasion. Meanwhile, Ronald Gravesande styles the outing. In states of undress, Jake goes from trim and proper to lounging in a Ralph Lauren wardrobe. Throughout the shoot, he wears dapper pieces from the likes of Topman, Vivienne Westwood, and Tom Ford. Jake wears sweater Vince, suit and shoes Topman. Jake wears turtleneck Reserved and pants Y-3. Jake wears jacket Theory, turtleneck Reserved, pants Gucci, and belt ASOS. 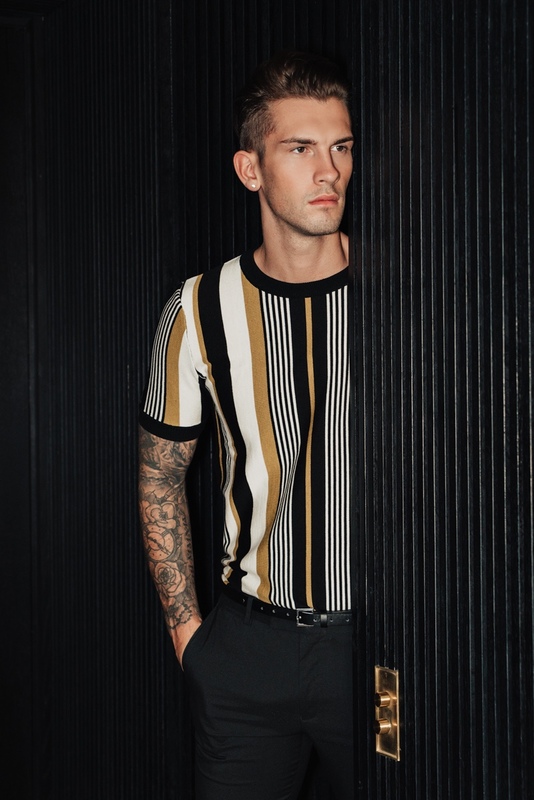 Jake wears striped t-shirt Topman and pants Dior Homme. Jake wears cardigan Vivienne Westwood and pants Tom Ford. Jake wears robe Ralph Lauren and underwear ASOS.